A verbal and literal mouthful these little bites are. Throughout the entire process of this recipe - from realizing I should do something with the pound of cashews sitting in my pantry to executing, photographing, and now snacking on them as I type this up - I've asked myself multiple times why I made them. Was it because of the abundance of cashews? Yes, that certainly played a role. Was it because I wanted to make a paleo, refined-sugar-free snack? Not really. I'd much rather make a fudgy brownie or a buttery cookie or something. You know me. And yet, here I am, presenting to you a paleo, refined-sugar-free snack. YET (again), it does not taste so (or at least, as one may expect). I can't pinpoint the exact taste, so you'll just have to take my word for it. With Halloween coming up, let's be honest - we can't ignore all the talk about sugar. Just as candy sales line grocery shelves, sugar detoxes and nutrition facts may lurk in the back of one's mind as she picks up a bag or two of said candy. Girl, I hope you disregard those sugar-haters of thoughts and buy that dang bag or two of candy! DO IT. Wait - real serious question... are you a Candy Corn person or a Reese's PB Cup person? If you are the former, send alllllll the chocolate my way because this senorita is most certainly the latter and will graciously accept your unwanted chocolate-y goodness. With open arms and an open mouth. Raise your hand if you remember being a kid, trick-or-treating in your cute (or scary) little costume, coming home to dump out your treasure, and sorting through all the candy. Keep your hand raised if you remember those two or three pieces that could NOT fall into any candy category - you know, the random pretzels, the dental floss, the loaves of bread (mhm, that happened once). Like, come on people, really?! I think about those days and I wonder what kids would think of these little bites if they ended up in candy bags. Would the bites be looked with confusion and disgust? 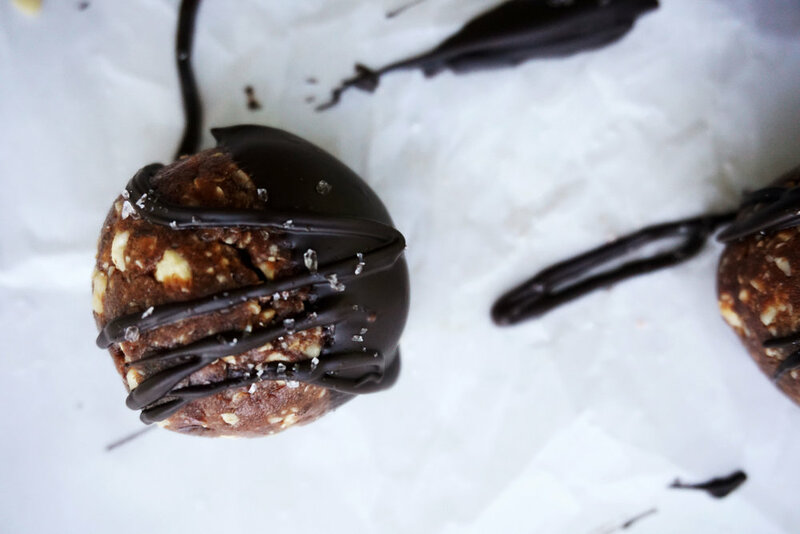 Would the kids curiously unwrap the package, lured in by the luscious chocolate drizzle, take a bite and find themselves pleasantly surprised? Would they have any idea of the paleo-, GF-, and vegan-ness these bites boast? Muahahaha. My childhood self would most definitely question what's going on here, but not for too long. I would most definitely finish the bite and probably seek out more. So, for both the candy-lovers and the sugar-haters and the sweet-tooth-less, I wish you the happiest of Halloweens and I hope you - no matter the category into which you fall - enjoy these rich, chocolate-y little bites (and some store-bought candy, too, of course #balance). In a blender, toss the cashews and pulse until finely ground (not butter!). Add the dates and pulse again until no chunks remain. Add cacao powder and almond butter by the tablespoon, pulsing between each addition. Scoop spoonfuls of the mixture onto a nonstick surface (I used parchment paper) and roll into a ball about the size of a golfball. Refrigerate until firm. In the meantime, melt the dark chocolate in a microwave or on the stovetop. Cool slightly and then dip half of each ball into the chocolate. If any remains, drizzle over the top of the balls. Sprinkle with sea salt and refrigerate again until chocolate has set. Serve immediately and store leftovers in an airtight container in the fridge or freezer.